Welcome home to Erika and Team Mariposa after a very successful outing at the 2018 Marshall and Sterling Finals in Saugerties, NY. Congratulations to Elle O’Brien, Katie Goulandris, Cairo Morrison and Sara Gottberg for their achievement in qualifying for this year’s Finals, which were held from September 12-16, 2018. 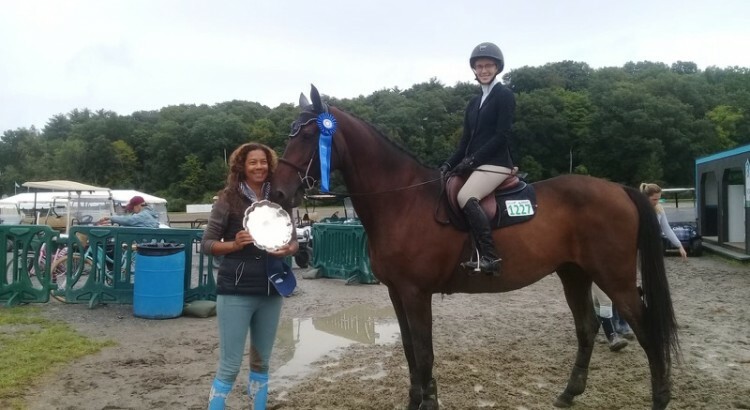 The riders were accompanied by our own Erika Adderley as coach, along with trainer Natalie Johnson Russell of Oakmore Equestrian Inc. from Orlando, Florida. Our riders made their presence felt from the very first day, with Cairo Morrison riding Hannah Nelson’s El Dorado to victory in the $1,500 Modified Child/Adult Jumper (2′ 11″). Cairo and El Dorado went on to make it a double victory by winning the $3,500 Modified Child/Adult Jumper Classic! Katie and Elle demonstrated their improved equitation skills while riding their own mounts Dreamboat and Cisco, respectively. The team’s success was capped off by Sara Gottberg’s 8th placing in the Hudson Junior/Amateur Equitation Classic (3’3″), aboard Tori Mark’s Greystoke. Congratulations again to Erika and all our riders! We look forward to seeing you all at Mariposa’s first show of the year on October 20-21!